Did you ever have one of the experiences that just stuck with you, in a good way? This past summer's trip to Quebec City, remains one of the best trips I've ever taken and the whole household talks about it constantly - making the Quebec motto of Je me souviens - I remember - very appropriate. This cowl/stole pattern is a tribute to that great city, and features a lace version of the Fleur di Lis so prominent on the province flag. The large scale lace pattern is backed with a no-sew lining, to provide extra warmth and a (subtle or bold) pop of color. 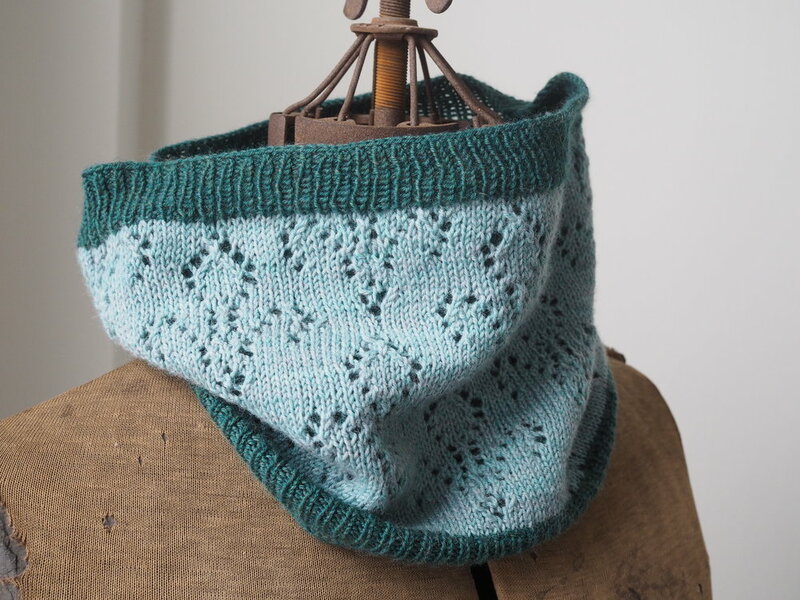 The stole version also provides instructions for adding a drawstring, so it can be worn around the shoulders as shown, or cinched up into a big cowl. The samples shown are both knit in Coop Knit's Socks Yeah, a favorite yarn of mine for its color palette, texture, and affordability. Souviens is available as a PDF pattern, a 2-skein cowl kit or 4-skein stole kit in three different colorways. In Craft, Knit, Patterns by Me Tags cowl, souviens, quebec, socksyeah!